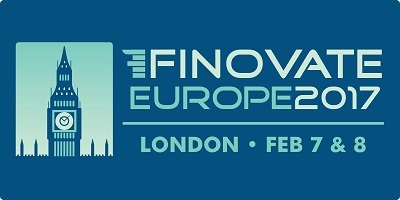 This year’s "FinovateEurope" took place in London on February 7 and 8, 2017, attracting more than 1,500 visitors. Following the tested concept, fintech companies had the opportunity to present their ideas to the audience in a seven-minute pitch. Despite—or perhaps thanks to—the limited time available, most presentations came out crisp and clear. Less is more. Who was expecting young geeks in t-shirts on this fintech conference would be surprised by the seniority of the people present? Apparently many experienced bankers and marketers have chosen a second career at fintech companies, and hearing their stories, they seem to love it. If one topic had to be singled out as the key theme of the conference, it has to be identity management. This is one area in which new technology based on machine-learning algorithms is developing fast. The machine gets better in pattern recognition—matching or sometimes surpassing the human mind. Reading ID documents, even when they are in a less desirable physical state, is no problem anymore for the computer. For instance, Mitek provides a solution in which the user simply takes a picture of an ID document with his or her mobile device, and the system verifies that the ID presented is a genuine, unaltered, and government-issued ID. Biometrics based on fingerprint, voice recognition, and other data is becoming standard technology. Machine learning also opens the way for creating a “virtual identity” of a person based on his or her behavior. Data can be compiled from several sources, including smartphone usage, geolocation tracking, and social media activity, to build the profile of a user that is very hard to spoof. Vendors combine ID documents, biometrics, and virtual identities to make it even more difficult for fraudsters to hack the system. HooYu provides an ID-checking service that uses online and social media identity data, ID documents, and facial biometric checks to prove that people are who they say they are. Signicat presented web and mobile solutions for login, identification, and electronic signatures by integrating with third-party digital identity schemes—e.g., in the Nordics and the Netherlands. Identity management is also central to the new payment initiation and account information services enabled by the revised Payment Services Directive (PSD2). The management of user consent (by strong authentication) for payment initiation and account information services is an issue for banks and payment service providers (PSPs). Fintech startup Token has developed an open banking platform to help banks meet the PSD2 compliance requirements and generate new revenue. PSD2 requires banks to open up their payment account data through APIs. PSPs that want to consume these APIs—e.g., for personal financial management solutions or payment services—would have to integrate with potentially thousands of different APIs. Companies such as Envestnet Yodlee address this issue by consolidating the different interfaces into a single API. PSD2 only adds to the increasing strain on banks to innovate with new digital solutions. One example at FinovateEurope was nCino, which offers a secure cloud-based solution, combining customer relationship management, loan origination, workflow, enterprise content management, and instant reporting capabilities. One company that made an impact with its pitch was CrowdProcess with its James product. James is a solution for credit risk modeling based on machine-learning algorithms and techniques. Apparently the team went to CERN to learn about the algorithms used in high-energy particle physics. The machine code that assisted CERN in detecting the Higgs boson could certainly be useful to improve credit risk models, they figured. The learning computer is extending its presence into many areas of banking and payments, as became clear in London. Pink Floyd once sung about it here as well—“Welcome to the Machine”! We’re looking forward to the next Finovate event: FinovateSpring in San Jose, California, April 26 and 27, 2017. Register here and enter promo code Aite20 to get a 20% discount.